Tasting Hawai'i With Moloka'i Chef James Temple: What do Hawaii and Japan have in common... NOODLE SOUP! What do Hawaii and Japan have in common... NOODLE SOUP! Hawaii has saimin and Japan has ramen, but basically they are the same thing... noodle soup. The most popular noodle soup in Hawaii is saimin, recognized as a traditional state dish. 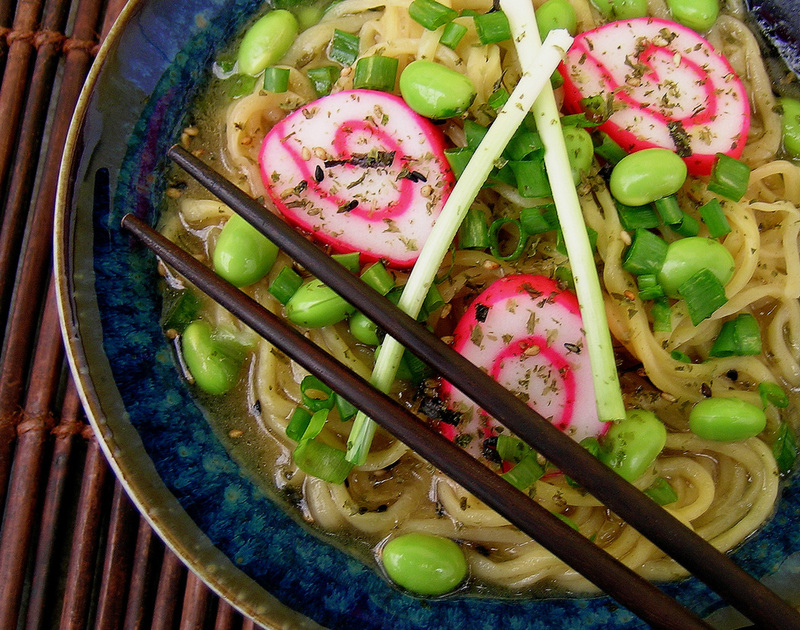 Both saimin and ramen have both become “soul food” for Hawaii and Japan. It is believed that Hawaiian saimin was created during the plantation era in Hawaii when Chinese, Filipino, Japanese, Korean, Hawaiian, and Portuguese laborers returned from the sugarcane and pineapple fields, they had communal meals. Each nationality would contribute something to the pot, giving birth to saimin, a soup dish made up of soft wheat egg noodles served in hot dashi (Japanese stock) garnished with green onions. Other items may be added such as, kamaboko (fish cake), char siu (pork), sliced Spam, linguica (sausage), and nori (seaweed), to create this uniquely Hawaiian noodle soup. Saimin is so popular here in Hawaii that it is served everywhere, even at McDonald's. Ramen is one of Japan's most popular dishes and commonly eaten Japanese food. It originally came from China. A simple bowl of Chuka Soba, egg noodles in a broth made from chicken stock seasoned with soy sauce, became popular for its taste, reasonable price, and fast service. In the 1980s, ramen shops started popping up everywhere as chefs used this simple bowl of soup as a blank canvas to create distinct varieties depending on geographic origin, variety of noodles, and soup bases. Miso ramen is made in Northern Japan. It has a miso base which is combined with chicken or fish stock. The stock is cooked with a thick, wavy noodle and is often topped with corn, bean sprouts, green onions and butter. The second variety comes from Tokyo. It has a light chicken broth base mixed with soy sauce and mirin (rice wine). This broth is served with a thin, chewy noodle and topped with ginger, kombu (kelp), bamboo shoots and chopped green onions. The third variety comes from Southern Japan and is called Tonkotsu. It has a rich pork broth with thin, firm noodles, garnished with roasted garlic. Ramen is commonly eaten in Japan with the head down near the bowl, then you "slurp" in the hot noodles. The air intake helps to cool down the noodles and it supposedly brings out the flavor of the soup. Today, this simple noodle soup has become the cornerstone of Hawaiian and Japanese fast food and millions of bowls are consumed every day. Health Note: Instant noodles are dried or precooked noodles fused with oil, and are often sold with a packet of flavoring that is high in salt and msg (monosodium glutamate). Instant noodles continues to swell in popularity all over the world. The world market for instant noodles is forecast to exceed 154 billion packs by the year 2017, driven by factors such as minimal cooking time, wide variety of taste and flavor profiles, and low cost of instant noodle products. While many of these fast foods are delicious, a serving of saimin or ramen is high in carbohydrates and low in vitamins and minerals. It is recommended by doctors that you add nutrients to your instant noodles such as chicken or eggs and fresh vegetables. It is my recommendation that you take the time to make your own chicken, beef, fish or pork stock and not use these flavor packets, which are not good for you. Stay healthy my friends. Making homemade stock is so easy and inexpensive. Store bought chicken stock is not good for saimin. These stocks are prepared for American dishes, not Asian. Also, avoid bouillon cubes or granules if at all possible. They are very high in sodium and don't have the flavor of homemade. This stock is great in saimin, instead of buying already made stock or using those instant flavor packets. Using a cleaver or a heavy knife, chop the chicken wings at the joints. Heat the oil in a large stockpot or Dutch oven over medium-high heat. Add half of the chicken wings to the pot; sauté until both sides are lightly browned, 4 to 5 minutes. Transfer the cooked chicken to a bowl. Sauté the remaining chicken wing pieces. Return the first batch of chicken pieces to the pot. Reduce the heat to low, cover, and cook until the chicken releases its juices, about 20 minutes. Stir in the ginger, scallions, garlic, peppercorns, and cook for 2 minutes. Increase the heat to high and add the boiling water and salt. Return to a simmer, then cover and barely simmer until the stock is rich and flavorful, about 2 to 3 hours. Strain the stock; discard the solids. Before using, defat the stock. The stock can be refrigerated in an airtight container for up to 2 days or frozen for several months. Makes 2 quarts. In a medium saute pan add the sesame oil, heat on medium and add the onion, cook until translucent, about 5 minutes. Add in 1 or 2 tablespoons of soy sauce depending on your taste, and the chicken stock. Cook to a simmer. Add in the shrimp and asparagus and simmer lightly for about 2 minutes. Add in the noodles and cook for about 3-4 minutes. Serve immediately topped with the bean sprouts, and a little chili oil on top if you like it spicy. Makes 3 to 4 servings.